Cryometrix is proud to announce the arrival of a revolutionary new product - the Cryometrix L-80 Liquid Chiller. Utilizing liquid nitrogen, the L-80 is the fastest liquid chiller on the market. Capable of chilling 120 gallons of Ethanol to -65°C in under 90 minutes, the L-80 is the most powerful yet price-efficient tool for chilling solvents. Featuring patent-pending technology, the L-80 is specifically designed to work with liquids like ethyl alcohol for CDB extraction. The L-80 is portable, requires zero changes to your build's infrastructure and has a low power requirement of 110 volts, enabling it to be implemented in any facility. With practically silent operation, the L-80 Liquid Chiller is ideal for chilling solvents or other liquids used in a lab, small manufacturing processes, or large-scale production facilities. Contact us at (801) 226-4100 for more information. (Depth x Width x Height) 1016 mm x 1219 mm x 1676 mm 40" x 48" x 66"
(Diameter x Height) 762 mm x 1168 mm 30" x 46"
A common type of CBD extraction uses ethanol to extract the useful cannabinoids. The warmer the ethanol, the more unwanted plant particulates are also extracted. Because of this, chilling the ethanol increases extracted Cannabinoid purity. Liquid chillers are typically large, bulky, and expensive, requiring large budgets for any research that required them. The L-80 allows for smaller, sleeker, and cheaper chilling of liquids used for research. The L-80 is suited for small operations or large scale industrial production. The L-80 will automatically stop pumping from the bulk liquid supply once the top fill level is reached. The L-80 will automatically stop pumping liquid out of the chilling chamber once the low level is reached. The L-80 constantly logs liquid temperature, LN2 pressure, and pump load. The liquid being chilled within the L-80 only comes into contact with food-grade stainless steel. The L-80 is small and portable, fitting into any workspace and can be moved with a pallet jack. Running on 110v, the L-80 can plug into common outlets. Zero heat is rejected into the room, so no HVAC is required. Unlike compressor-based chillers which have hundreds of moving parts, the L-80 has only a few moving parts, so very little maintenance is required. You will not need to run any power to your building when running our chiller. The low temperature of LN2 enables the L-80 to chill rapidly and to lower temperatures. There is zero contact between LN2 and the operator or product. LN2 storage is simple and completely autonomous. Nitrogen isn't flammable or explosive like many refrigerants used in compressor-based technologies. The 100% stainless steel design is easy to clean without harsh industrial chemicals. Cryometrix products only emit nitrogen outside your building, which already makes up over 75% of the Earth's atmosphere. Cryometrix products don't use traditional mechanical compressors that utilize refrigerants, an example being freon, to produce cold temperatures. These are noisy and use large amounts of electricity. LN2 has a boiling point of -196°C, enabling temperatures as low as -196°C. Most refrigerants have boiling points greater than -100°C, making it difficult for technology that uses them to generate temperatures below that. Cryometrix tech use 7x less electricity than comparable products. LN2 operates on pressure and requires no electricity to function, enabling it to function without power in emergency situations. 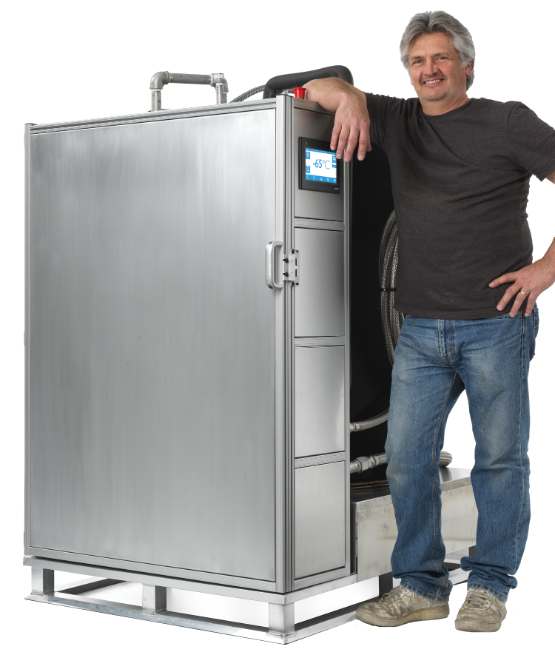 Cryometrix freezing technology doesn't require HVAC systems to cool the ambient temperature in order to operate. It can operate in any ambiance and cools the environment around it. There are practically no moving parts in Cryometrix LN2 freezing technology, making it last up to 4 times as long as comparable freezing technology, in addition to requiring hardly any maintenance. Practically silent when in operation. Cryometrix products consume little electricity, enabling the customer to add additional units to their facility with zero electrical complications. The effective footprint is 16 square feet and little to no space is needed on the sides, easily fitting into any facility. 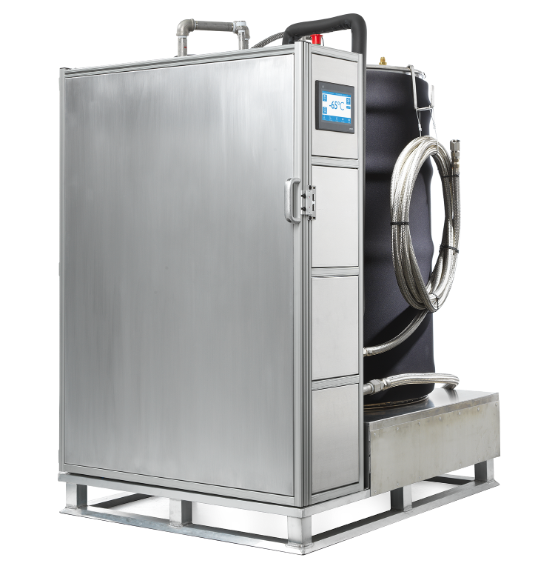 The L-80 can chill any liquid that can handle the ultra-low temperatures at which it operates. The Cryometrix L-80 Solvent Chiller has the smallest footprint for its liquid chilling capability, costing less in floor space and allowing you to fit more units in your current space. The simple functioning and operation of the L-80 doesn't require extensive training, reducing labor costs and risks. LN2 technology uses much less electricity than traditional compressor-based technologies. Cryometrix products don't need energy intensive HVAC systems to operate efficiently. The increased capability of the L-80 allows faster turnaround times and thus greater profits. No LN2 is exposed to the sample, maintaining the samples integrity. The L-80 automatically tracks temperature and other useful data. A cryogenic pump maintains high flux throughout chilled liquid, maintaining even temperatures throughout. Enter width, height, and depth of your product to calculate the storage capacity of your freezer.